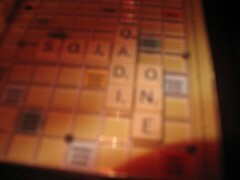 F-train: I don't read your Scrabble blog. F-train came to visit me in the ghetto, braved the evils of Times Square to buy a Scrabble set and violated his previously declared "I wont ever play you in Scrabble anymore because you know 'words'" rule. And for all these amazingly nice things from a guy known as "assface," I did not blog about our game. 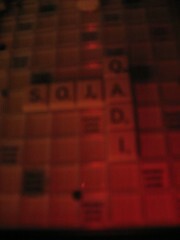 F-train, on the other hand, went and told my Scrabble tutor about my two...er...maybe three mistakes in the game. So, after being mercilessly taunted by Fisch for the last two days because I let said assface play "Fi" on me, while I was too busy looking for a bingo with the tiles: deeitss. (I came up with sedites and desisters, but F-train challenged them both off the board.) I have decided to set the record straight on my 300 point destruction of F-train. Reenactment style. Well, ok, we're only going to reenact one particular series of genius moves on my part. Never mind that I got him to challenge the word destain or that I played yi on him without a challenge or that in the middle he was crying about his bad tiles and how he needs a handicap. F-train decided to adopt a closed board strategy on me, which actually is a pretty good road to take...if you know a lot of high scoring three and four letter words and all the possible hooks. F-train. Does. Not. So, he plays something -- I don't remember what, but I pluralize it to make the word soja. Which he doesn't challenge, even though I needle him to. This leaves both the J and the a hanging in double word scoring lanes. 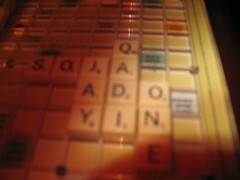 I have QDITESA on my rack, so I can make a word with the J on the double,but Ftrain will probably take that, I just hope I'm able to dump the q on that double word after he plays. 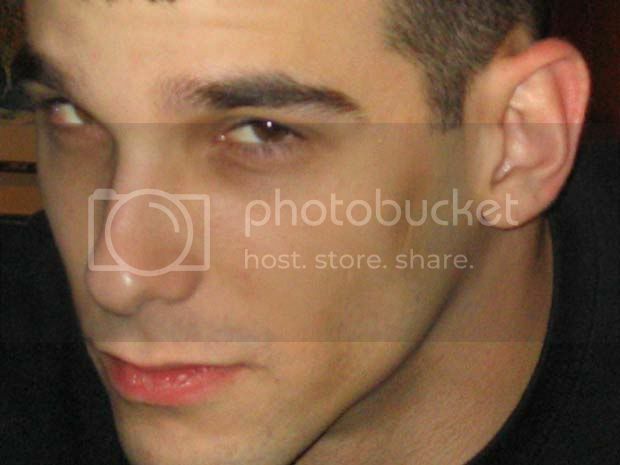 F-train thinks for a long time, periodically saying "I know you want that j", but instead he exchanges! HA! F-train doesn't challenge. I draw y, a, n. Boo. Stupid y. Plus, I figure he'd definitely take the j double word now. But no! At first I was mad because he did block jet...but then I saw that really, he gave me a way to play the y off with the j for the double word. And so, boys and girls, today's Scrabble lesson: you mess with the bull...you get the horns. I now await Fisch's comment of "Fi." Fi..I mean..Hi I just started playing scrabble recently and I was curious as to how you didn't know one of the 2 letter words? You play at clubs and you have a scrabble blog, but you don't know your 2s? It doesn't even look like a word. You're no student of FIsch. Cause he knows his 2s. You have a problem, Sir. I've never heard a song about the notes of the chromatic scale. 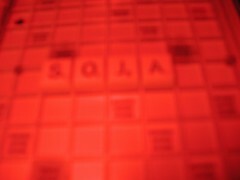 If Scrabble were easy everybody would have a Scrabble blog. Alceste singing. HAHAHHAHHAHAHA...totally worth the humuliation of having a Scrabble blog. fi (prounounced fee) - the solmization syllable used for the semitone between the fourth and fifth degrees of a scale. I'm surprised "fi" is not a scrabble word. hahahahahahaha, okay who's gonna start the petition to make fi a valid Scrabble word? I am reasonably sure I'll learn plenty of new stuff right right here! Good luck for the next! Good day! I could have sworn I've visited this site before but after browsing through a few of the posts I realized it's new to me.